Focusing only on one sport, year-round, can increase kids' risk of injury and burnout, according to a clinical report from the American Academy of Pediatrics (AAP). Authors of the guidance document, Dr. Joel S. Brenner and the AAP Council on Sports Medicine and Fitness, advise pediatricians and parents to keep in mind that the primary focus of sports for young athletes should be to have fun and learn lifelong physical activity skills. 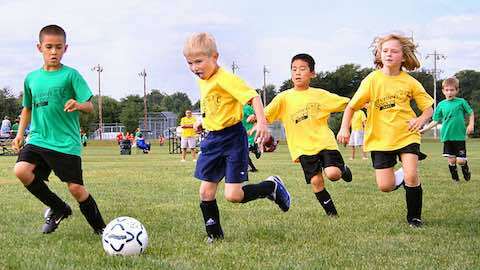 Playing multiple sports, at least until puberty, decreases the risk of injury, stress and burnout, they add. Specializing at a later age, perhaps in the late teens, may be a better route to accomplishing athletic goals than specializing earlier in life, upping the odds of lifetime sports involvement, lifetime physical fitness and potentially elite participation, the report concludes. "As they note, early specialization is in most instances unnecessary and can contribute adversely to social, emotional, and physical (eg. chronic over-use injuries) development," said Shane V. Caswell, professor of athletic training at George Mason University in Manassas, Virginia, who was not involved in the report. Kids who have specialized in a single sport should discuss their goals with parents or coaches, according to the guidance statement published in Pediatrics. Taking at least three months off their specialized sport per year, and one to two days off per week, allows for physical and psychological recovery. Young athletes who train intensively should be closely monitored for physical and psychological growth and nutritional status, the authors recommend. "This article highlighted the darker side of youth sports, the overuse injuries that we're seeing from children simply doing too much," said Dr. Avery Faigenbaum, professor at The College of New Jersey, who researches exercise interventions in public schools. In recent decades, kids have started to specialize in one sport very early in life in hopes of playing professionally, but the science says that diversifying sports participation makes kids more likely to be successful and to stick with the sport, Faigenbaum, who was not involved with the report, told Reuters Health. "That message from science and practice is not reaching patients," he said. Sports should be fun and help kids make friends and learn new skills, he said. Specializing too early can decrease creativity, he said. "If you only play baseball, and get really good at baseball, the same muscles, tendons and ligaments get stressed over and over again," leading to overuse injuries, which are fully preventable, Faigenbaum said. "It's a sign of bad training, the child was doing too much, not exposed to a variety of activities with adequate rest," he said. "This is preventable if we do a much better job of educating coaches and parents, diversifying sports participation and building that foundation on athleticism." Article: Copyright © , Reuters Health. All rights reserved. "Single Sport Focus Increases Injury Risk"